Does converting image formats, such as from JPG to PNG, have any effect on image quality? I know converting from RAW to JPG has disadvantages, but what about other format conversions? Going from JPG (which is a lossy format) to any lossless one (like PNG) does not. Going from any format to a lossy one, yes, including JPG to JPG. It could be too little to notice, and using the same compression ratio loses a lot less on the second saving than on the first one, but yes, it is cumulative. But beware... Some image formats store more information than others. For example, a CMYK JPG file will be ruined if you save it to an RGB-only file format, like PNG. If you have something like transparency, you will lose it by saving in a file format that doesn't support transparency. 16-bit images will lose their extended range saving into an 8-bit per channel one, like saving a 16-bit TIFF image as a PNG. Layers will be lost saving in almost any generic file format. Effects could be lost saving as an older version of the native file format of some program, like Adobe Photoshop's PSD format. If you drop the color profile, the image could render very different on some applications. Some of this changes are not necessarily about "quality", but about the "information" inside the file. Colorspace conversions will result in some losses (mainly rounding errors). Decreasing color depth loses color information. Layers and effects may be lost. However, regarding JPEG, I disagree somewhat. The losses that result from repeatedly saving JPEGs at the same setting is limited. Eventually a steady state is reached where no further losses occur. I avoid saving over original out-of-camera JPEGs, but if it happens accidentally, it's not worth worrying about too much. Saving from a JPEG to a lossless format does lose information, in particular, the invisible quantization tables used during the compression process. 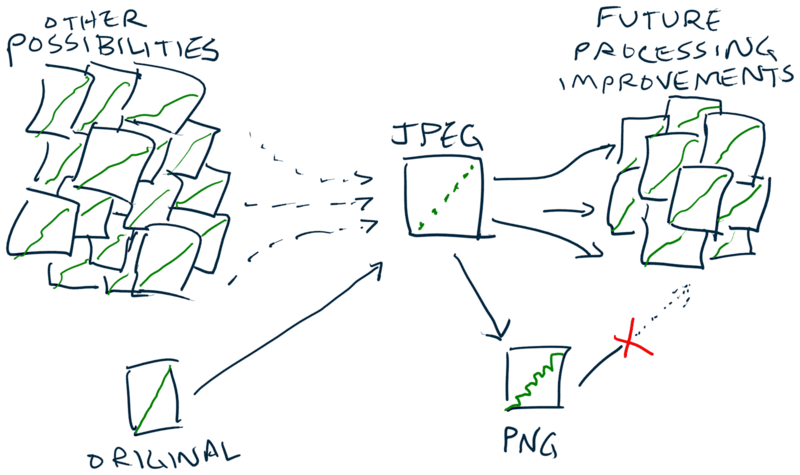 Losing this information prevents the use of future processing improvements, such as by JPEG decoders like knusperli and jpeg2png. If the only format your camera (phone) produces is JPEG, it is prudent to preserve that file as if it were a raw. See Is a JPG guaranteed to produce the same pixels? Not the answer you're looking for? Browse other questions tagged raw image-quality jpeg file-format png or ask your own question. What are the merits of using a particular image file format? Why don't most cameras support PNG format? Would you use an online RAW image processing application? Difference between PNG and RAW, other than compression? Does a .png file extension on an iPhone image mean that the photo was edited or altered in any way? Does it make sense to use a RAW converter program on a compressed image?